especially if you felt strong when you did it! At the end of 30 days, share with your mentoring partner. Look for patterns and evidence of your talents and strengths. Not many complete it, but those who do manage to reflect, even for a few days, report much deeper understanding, greater ability to appreciate and apply their strengths and increased confidence. It lays a foundation for the follow-up workshop where the learning has a much deeper impact. shuts down exploration of alternatives and possibilities in problem-solving. increased happiness and lower burn out. Talking – conversation, responding to thoughtful questions in order to gain insight, discussing alternative courses of action. Some people hate writing, others love it. Never-the-less, some academic courses and professional development programs, such as in nursing and teaching, require reflective writing as evidence of learning. The biggest problem with reflective thinking is taking out time to do it! It is often not seen as legitimate work. Yet some call centres got people to spend 15 minutes at the end of their shift to reflect on lessons learned and achieved a 23% performance improvement in 10 days. Bill Gates, Warren Buffet and Mark Zuckerberg are famously known to take time out to think. In the right hands, talking is a powerful reflective medium. Unfortunately, in conversation too many people are just waiting their turn to speak, rather than listening, probing deeper thought and asking questions that create insight. However, a skilled coach or mentor can elicit profound wisdom by facilitating reflection through conversation. Teach people the value of reflection and point out the penalties of not reflecting. Ask questions and ask people to think. Follow a brainstorming process with thoughtful analysis of alternatives. Encourage people to play “devil’s advocate” or “black hat” when talking pros and cons. Give positive feedback to people who engage in conversations, rather than argue, about alternatives. Use a non-threatening review process. A successful manager, who consistently bought projects in on time and within budget, said it was the reflective process that the whole team engaged in at the end that led to continuous improvement. It was a simple discussion of what went well, so they could replicate it in future, and what did not go well that they could avoid. Trust was critical to the success of this conversation. It was an honest analysis of events, not about praise or blame. You can train your brain to operate in reflective mode more often. Notice yourself reflecting. When does it happen? It will often be when you’re a bit relaxed – in the shower, in the car, walking in the park. Capture the good ideas, answers and insight before they fade and put them to use. Take time out. Build the habit. Go for a walk at lunch time to review the morning and plan your afternoon. Use the last 5-15 minutes at the end of the day to think about what you accomplished, what went well and how you can do more of that and what you might do differently in future. Or, use your commute time as your daily review. You can use a notebook or your smart phone to record ideas. Overtly demonstrate your own reflective practice at work as a model to others. And, have and be, a trusted friend, mentor or coach who just listens. 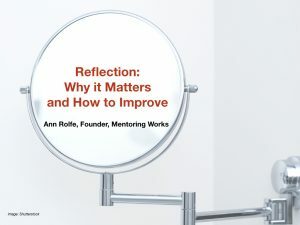 Ann Rolfe is internationally recognised as Australia's leading specialist in mentoring, and is available for speaking, training and consulting. Here Ann shares her knowledge and allows you to ask your most pressing questions about mentoring. ← What’s Missing in Workplace Learning? I agree Ann. 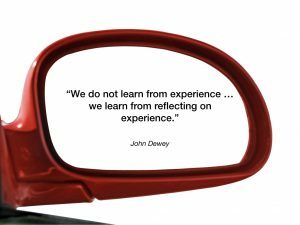 Reflection helps us maximise the learning, because we are reviewing in a context specific to ourselves. It is real, relevant and we have ownership of it.